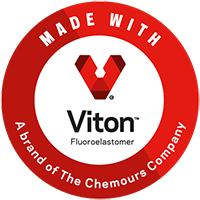 Elastomer, Inc. has been specializing in fluoroelastomer sheet products since 1990. Specialty compounds designed to offer resistance to extreme chemicals, bases, steam, explosive decompression as well as low temperature, conductive and nonconductive properties. 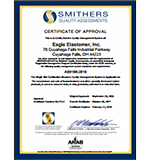 We also offer certifiable compounds that meet AMS 3216G, USP class VI, FDA compliant, Dupont Company U2A and SU2A sheet specification. Cured fluoroelastomer sheet roll – 0.010” to 0.019” thick can be made 12” to 24” wide and 30 ft continuous length. Cured fluoroelastomer sheet roll – 0.020” to 0.062” thick can be made 12” to 36” wide and 30 ft continuous length. Our sheet products are fully post cured to give the product the best physical properties possible. We offer the industry standard RMA IP-40 tolerances as well as close tolerance sheet products for certain compounds. Eagle Elastomer stocks inventory on most of our sheet product compounds which allows us to ship our sheet products in a short lead time We encourage you and your team to visit our facility to view our capabilities. 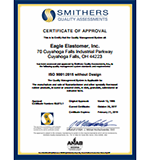 Thank you for your interest in Eagle Elastomer, Inc. If you have any further questions, please contact us.